President Paul welcomed members and guests to the meeting at 7:10 pm. Guests included partners Jan N, Helen L, Marilyn J, Lorraine H, Maree J & Heather M & our special guest speakers Jan Nulty, assisted by Sandra West & Faye Jose. Neil reminded us of the Peace dinner next weekend & mentioned & thanked those who are helping with the catering. Ian asked if any new members would like to replace him at the District Assembly on Sunday, March 4th at Young as he will be unable to attend; new members would find it most informative & rewarding. 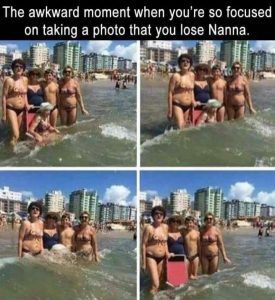 Just a reminnder to keep your eye on Nanna next time you're at the beach. Next Monday's guest speaker is Patrick Leary at the usual time and place. Pat will be speaking about his re-enactment of the charge of the 4th Light Horse Brigade at Beersheeba, and will be presenting descendants of local residents who fought in that war with military mementos. It should be a very interesting presentation, so members are encouraged to bring partners and other guests along. This weekend is the Peace celebrations in Wagga; come along and support a worthy cause! Monday, March 5th is a club assembly. Don't forget to read the Diary & quote of the week below. Jan Nulty gave a talk on the role of the Local Health Advisory Committee (LHAC), assisted by Sandra West and Faye Jose. Jan, Sandra and Faye are members of the group & spoke on the projects they are involved with. The committee consists of 7 members at this time and are looking for new members, especially males, to fill a few positions. All members are volunteers & meet monthly (1st Monday of each month at Community Centre) with Pam Bates, the facility manager & together work at identifying local service needs, improving access to services & assist in planning & development. Sandra is the publicity officer & spoke on the Memory Van & all the various aspects of dementia. 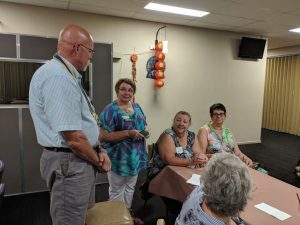 Sandra appreciates being able to use the Coolamon Community Chronicle (a Coolamon Rotary initiative) to spread the word about their programs. Faye is a ‘Jack of all trades’ (her words) on the committee. Her roles include Mental Health First aid course and working with Music 4 Mates. The mental health initiative focuses on anxiety, depression, schizophrenia, etc. & how to support people with symptoms. The committee also promotes bowel cancer awareness and ways to get more people to participate in bowel cancer screening programs. President Paul presents the ladies of the Local Health Advisory Comittee with their gift and thanks them for the fantastic work they do for the community. 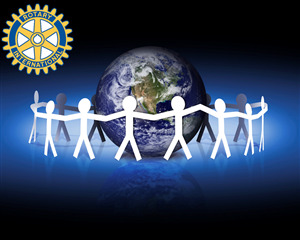 The idea of Peace Communities was initiated in District 9700 in 1992, and has been embraced by many Rotary districts and clubs around the world. Coolamon was the first Rotary peace town in the world, and many Peace Cities have now been designated. Rotarians committed to furthering peace set up peace symbols on suitable sites and, along with other community members, meet on special days to recognise local citizens, students, schools and organisations for their contribution to Peace in Action within the community. 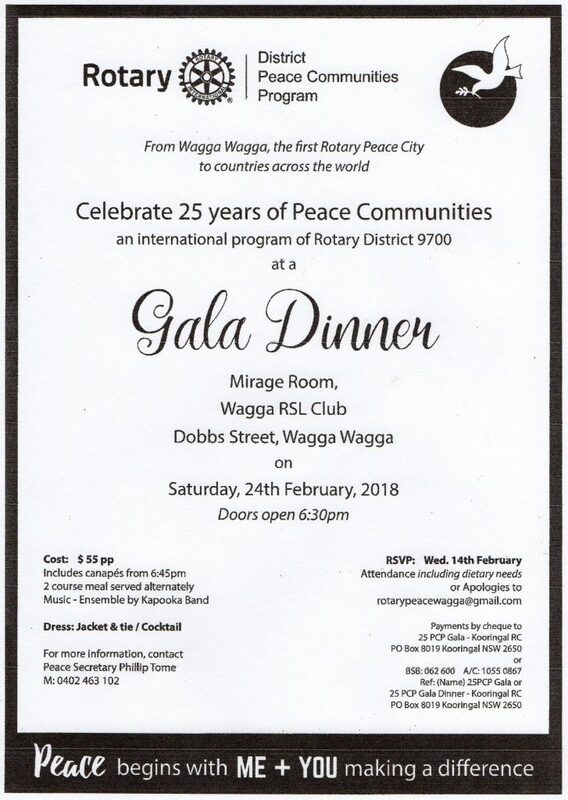 To this end, Rotary is celebrating 25 years of the peace communities by holding a peace program over the 23rd-24th of February, concluding with a gala dinner in the Mirage room at the Wagga RSL Club on the 24 Feb. Come and join in the celebration (details below). For more information about peace program click on the link below. Last week's Quote of the Week is attributed to Paul Hogan. Monday 26th February - Guest Speaker. Patrick Leary speaking on the re-enactment of the charge of the Light Horse Brigade at Beesheba. Coolamon Sport & Rec Club, 6:30 for 7:00 pm. Friday and Saturday, 23rd-24th February - Wagga Wagga Peace Celebration. Monday 5th March - Club Assembly. Coolamon Sport & Rec Club, 6:30 for 7:00 pm. Saturday & Sunday, March 3rd & 4th - PETS (President Elect Training Seminar). Coolamon will be represented by PE Daryl Breust. Thursday March 8th - BINGO. Neil M (Captain), Dave McK, Leslie W & Bruce H.
Monday, 19th March - Foundation Dinner Evening. Saint Michael's Convent with guest speaker District Foundation Chair David Kennedy. Saturday, 31st March - Easter Markets & U2D Art Battle. UTDS, 9:00 am - 1:30 pm. Monday 23rd April - Guest Speaker. Denise Winkler on ‘Education’ at Coolamon Sport & Rec Club, 7:00 pm. Saturday & Sunday, 5th-6th May - District 9700 CONFERENCE. Roxy Theatre, Leeton. Book accommodation early! 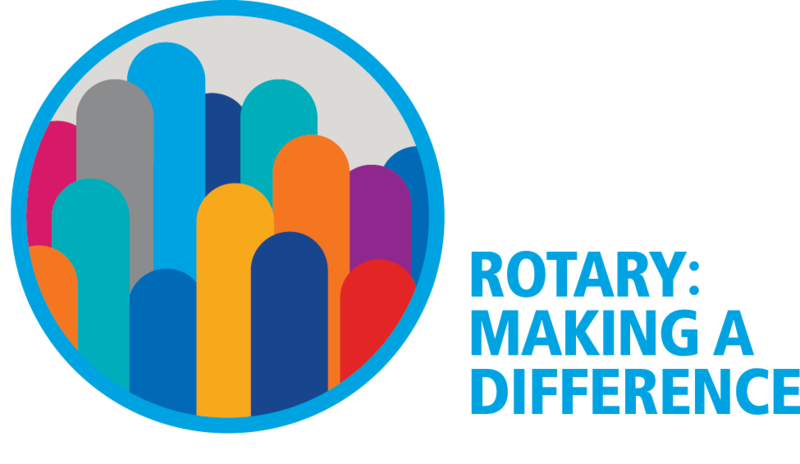 Saturday, 23rd June to Wednesday, 27th June - Rotary International Convention. Toronto, Canada. 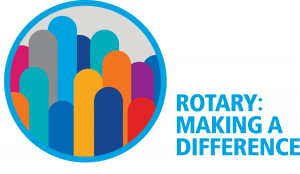 *Saturday, 30th June - Coolamon Rotary Changeover and District 9700 Changeover. Ganmain Hall. We still need a president elect for 2019-2020; please give some thought to either nominating yourself or nominating another. We are still looking at appointing two more Assistant Governors.